As with the previous Cape Audax, an official ride report was created. But rather than be lazy two entries in a row, I have also written a personal account of the ride. It was after all the first full PBP qualifier of our SR series. It’s rather an odd feeling to finally be gathering to ride an event which you and a handful friends have created. OK, that statement would be equally true of the last Cape Audaxes in September and October too, but a few things were different in this case. For this event we had some riders arriving who none of us knew – inspired to take on the challenge by some active discussions on The HubSA over the past few days. That inspiration had also caught my friend Hendrik’s imagination too, and he’d volunteered to drive safety car for us. An amazing act of generosity which I wondered if our midnight start might have dampened. But as we pottered around the Vrede Wines car park getting ourselves sorted, he had a distinct sense of energy and excitement despite the crazy hour. In Henri Meier’s case this excitement was more a case of nerves whether he would be able to ride at all – his car had helpfully locked the keys, and all his cycling kit, inside. Fortunately Henri’s son arrived with spare keys in the nick of time, and after a short pre-ride briefing we were under-way. It was clear immediately that the faster riders had no intention of holding back, and they were out of sight over the first kilometres. Designing a full distance route had necessitated a slightly untidy detour into and out of Stellenbosch with a control only 14km into the ride. The fast group were already heading back out of the control as our main bunch pulled in. No one needed supplies of course, so we got cards signed and wheeled straight out ourselves – well, almost straight out. We tried to resuscitate Gerhard’s dead Garmin for a few minutes, but it was beyond saving. I know I’ve often commented here how much I enjoy dark hours riding and this leg into Wellington and then on to our first control in Riebeeck Kasteel was no exception. A freshening headwind kept us cool the whole way, almost cold in fact. It’s common to see owls and various animals on these quiet night-time roads, but about 10km out of Wellington on the R44 we were treated to an up close and personal encounter. My headlights picked out a barn owl sitting on a low road marker less than 2m away from me as we passed. I could almost have reached out and touched it. Utterly unphased by our presence, it just sat there and watched as we whirred passed, and then lifted lifting silently into the air and flew alongside us for a short way, before vanishing into the dark. With no shops open in the sleeping town of Riebeeck Kasteel, Hendrik had agreed to provide a manned 1st control. I don’t think any of us were prepared for what greeted us as we rolled in though – it was more like a camp than a control. Table, lights, water, coffee, home made beskuit. I’ve done official races that offered less at a water stop. It was all too tempting to stop longer, but we pushed on to Moorreesberg for the 2nd control. By now, the wind had gathered and was now becoming strong enough to slow our speed. Battling away into it, I slipped off the back a couple of times. I’d donned my jacket at the control, but it seemed to be acting a bit like a sail pushing me back now. I was still too cold to take it off though and soldiered on, the guys slowing for me thankfully. I’m sad to say with the focus on battling the wind, I didn’t really notice the sunrise much – except to note a slight orange glow on the horizon, which was swallowed soon after as it rose into a heavy grey blanket out of cloud. It was fully light by the time we reached Hendrik again though – he had found an open fuel station for our control, but most of us still opted for Hendrik’s far more welcoming coffee and supplies. At only just over a quarter of the distance we were already more than 2 hours ahead of schedule. The ride was going nicely, but this next leg would be tough – it would start out across the strong winds, and then swing directly into it for the last 40km or so to the half way point. Whether the drag from my jacket was real or imagined, I was struggling to keep up. Rather than have the guys keep waiting, Peter made the call that we drop back to an easier pace. It was exactly the right decision – it was clear that Henri, Gerhard and Nico were riding a stronger pace than either of us should be trying to sustain this early on. A rather weird Don Quixote thought flashed through my mind as we turned right towards Hopefield and rode through the middle of an enormous wind farm. Towering masts with triple-bladed propellers slowly spinning all around us. It was all rather surreal. We’d watched the 3 guys slide off into the distance, but caught them again at the Hopefield town sign. They were having a brief chat about the route, and whether to join us looking for breakfast or push on to the next control. I wasn’t at all surprised they opted to push on, but Peter and I decided a short stop was in order. Breakfast was only possible because a lovely lady named Ella had agreed to open early and serve us – the power of the simplest marketing device on the planet, her cell number painted on the cafe door! It also gave us a chance to look after Hendrik for a change. The three of us enjoyed great coffee, a hot breakfast, and some friendly banter together in this unexpected oasis. Needless to say, despite his protestations, we flatly refused Hendrik’s contribution to the bill before we reluctantly battled out into the windswept landscape. The sign as we left Hopefield was not encouraging – Veldriff 36km. All of that would be into a full force headwind now, no shelter or respite. It was going to be a long slow tow. We did stop briefly – a tortoise was stranded in the middle of the tarmac, and Peter called for us to enlist some good karma by relocating it safely to the side. Fortunately for both us and our hard-shelled friend, the traffic was very light on this stretch. The landscape was barren – fields, salt-marsh and scrub-lands. But at cycling pace there was more to it than immediately obvious. Abundant wildlife, slowly taking over a few run down houses dotted either side of the road. We saw hundreds of bright orange and yellow crickets – they felt somehow alien, their luminous markings out of place against the subdued surroundings. For much of this stretch we followed a railway line, the ramshackle remains of a remote station and sidings of rusting trucks suggesting a now much diminished role in the local economy from it’s glory days when presumably it provided a lifeline to Cape Town and the world beyond. The still heavy brooding clouds were a fitting backdrop to the sense of decline – an ever present and ominous threat of rain. Dreary, desolate, endless, but above all of these, beautiful. The tortoise wasn’t the only slow moving object – Veldrif seemed a very long time coming. But as with all Audaxes, steady and persistent pedalling slowly ground the distance down. The last kilometre brought a final brutal onslaught – a right turn swung us square into the howling wind. The control was in sight, but took an age to reach as we slogged our way over the Berg estuary bridge and into the town on the far bank. 11am and halfway. Despite the winds we’d made great time. From here we’d turn around and the wind would be more often friend rather than foe as we headed back South. The petrol attendant helpfully told us the lead group had raced through at 7am – some four hours earlier. With crampy legs it was hard to comprehend how anyone could ride that fast. But if randonneuring is about anything it is diversity – all manner of riders and bikes join to take on their own personal challenge. I was looking forward to a fast stretch to our next control but it didn’t quite work out like that. The wind was across more than behind – so although it didn’t slow our progress, it wasn’t pushing us much either. Peter had started suffering a bit from Hopefield, but now he took a significant turn for the worse. It was clearly more than just fatigue as his stomach finally gave up the fight and he was forced to find a road side bush to evacuate both ends. Clearly some bug or something eaten was now adding to the difficulty of the ride. I honestly thought he would bail, as did Hendrik – waiting nearby to take him on-board in case, powerless to help otherwise being outside a control. Somehow a mix of coaxing on my part on determination on Peter’s got him back on the bike. I’d pointed out the town of Vredenburg was just ahead, and once over this last hill the control at Saldanha was a mere 10km further on, almost all of which was downhill. Even feeling poorly, very little effort would be needed to get there. Being a control it was also an opportunity to regroup – access supplies in the safety vehicle, and a calmer assessment of the situation away from the pressure of riding for a few moments. Somehow this thinly clutched straw of a theory worked. I could see Peter was already feeling brighter by the time we pulled into the BP station where Hendrik was parked. We took our time – and whilst we recovered I saw something completely new as Peter downed an Ultra Mel custard. He reasoned it was loaded with energy and at the same time gentle on the stomach. It seemed such a bizarre thing to have packed in your kit bag. But it worked like a bomb and before long we were riding out again, bound for Langebaan and entry to the West Coast National Park. We fairly flew past the iron and steelworks to our left, and the supporting harbour and docks on our righthand side. Peter narrated our flight with interesting facts: the enormous docked oil rig part of a new local industry, taking advantage of high prices in Cape Town harbour to offer an alternative for refurbishment and servicing; the large and heavily fortified complex to our left actually a huge oil storage terminal, a throwback to apartheid days when the threats of sanctions necessitated secure places to stockpile large quantities of such essentials. Clearly Peter’s spirits had recovered as well as his physical condition. Running downwind at our rapid place, we were soon entering the the outskirts of the Mikenos development, so expanded that there was no real demarcation line – the holiday homes now more of an extended sprawling suburb of Langebaan beyond. 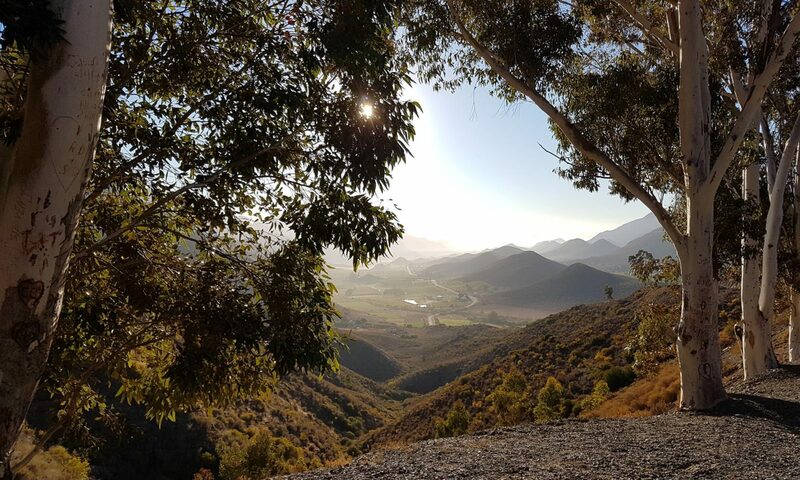 Ignoring the inviting places to eat in town, we pushed on to the park – although a couple of short, steep and painful climbs through housing estates were required before we finally reached the San Parks entry gate. What a joy – ahead lay 25km of quiet roads through sublime scenery, and we were still at least a couple of hours ahead of schedule. No need to rush, we could savour this most welcome stretch of scenic beauty. As is often the case, we actually saw little in the way of large animals – no Eland, despite copious spoor across the road. We did seem to arrive at snake sunbathing prime time however, counting at least 3 puff adders basking on the warm late afternoon tarmac, and a golden-bronze Cape Cobra that coiled and slithered it’s way across the road in front of us. It was tempting to head to the restaurant at Geelbek, but they would likely be closed or closing soon. So we pushed on, all the time flanked by dunes, coastal scrub, and the serene peace of this wild and beautiful place. The afternoon was still hot when we had entered the park, but the shadows were lengthening and air cooling as we rolled up and down the last few kilometres to the exit gate. Our peaceful amble through the park sadly was all too short. The contrast with busy speeding traffic as we swung right onto the busy R27 could hardly have been more complete. It’s virtually impossible to plan a route along the West Coast without involving some time on either the N7 and the R27. Fortunately we’d managed to minimise the time spent on either of these, and as unpleasant as these few kilometres were, they were soon over. The final few hundred meters to the right turn to Yzerfontein though were a brilliant example of road designers having no regard of cyclists. In an effort to slow traffic down ahead of the turn, the entire safety lane was filled with lethal saucer sized speed bumps. Far too dangerous to ride over or around, we had no choice but to stay right in the lane with the very speeding cars these were design to impede. It was a terrifying few minutes. I waited a few minutes for Peter to make sure he didn’t miss the turn. We’d seen Hendrik at the exit to the park, and before driving on to the control he’d informed us the next group of guys were only an hour or so ahead. They must have already come back up though as we didn’t pass them on the 10km or down to the pretty little coastal town. Peter was suffering a serious attack of the dozies by this stage (a common randonneuring affliction from too many hours in the saddle combined with too little sleep before). I felt rather cruel yelling and barking at him, but was worried he might just nod off and sleep where he fell. It was something of a slow trudge into town – the one obvious restaurant wasn’t open, but at least the Spa had hot food and coffee. By the time Hendrik and I came out with supplies, Peter was propped up on a wooden staircase, eyes closed busy nodding off. We lingered a while, but daylight was fading and time moving on. Peter was somewhat recovered so we pushed on. I’d hoped to make the Malmesbury Wimpy in daylight, but with the undulating terrain and tiredness our speed towards Darling had dropped considerably. 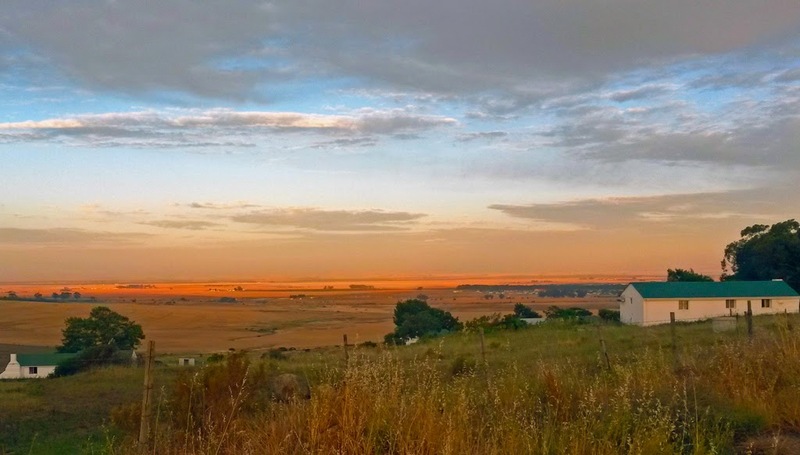 By the time we sat on top of the last hill looking down on the town, shadows were lengthening and the rolling Swartland pastures bathed in orange evening light. It was a glorious sight, even if it did signal that our next leg of dark riding would be upon us way before the next control. I stopped for a quick call home. My timing was just off though. I managed a quick chat with Yoli whilst looking out from this wonderful vantage point, but missed a goodnight call to Ben who was already in bed. Hendrik came alongside whilst I was chatting, clearly concerned I’d stopped with a problem, and then soon after Peter came up too. I waved both past with a quick hand-signal intended to indicate I was calling home – I suspect my flapping gesture may not have conveyed that at all accurately, but they seemed to get the gist. I caught back up with both of them in Darling. Apparently Nico had been considering bailing here – legs tired and overworked. But he’d shown proper Audax experience and rather than making any decision on an empty stomach had searched out a restaurant for a meal. The food had clearly done the trick as he was long gone by the time we rolled through the town. I half expected to see him along the road or at the Malmesbury control, but he’d got his second wind and pushed on home without needing a further food or rest stop. By now I was getting the dozies too. I apologised to Peter. I needed to stretch my legs and raise my heart rate to wake myself up. I urged him to keep the pace going, and then paced off at full speed to try and shake myself back into some state of alertness. It worked – combined with the now chilling night air, my increased speed and effort woke me up nicely. For a few kilometers my speed picked up over 30km/h. By the time I dropped back to a more sustainable pace the last light had gone, but I was fully awake again. My little sprint must have done something for Peter too. I stopped on one of the many rollers leading into Malmesbury for a quick shot of coke and chunk of Snickers bar – and as I stood there enjoying the peaceful night air, I could see what could only be Peter’s front light less than a couple of kilometres back. He must also have picked up his pace too. Just before the town was a section that worried me ahead of time. A remote area just beyond the shacks at the edge of town. Scarily, this worry materialised in the form of a couple of very dodgy looking guys shining bright lights at us as we crossed the railway line. It seemed their idea might be to jump us whilst we were blinded by the light. Fortunately Hendrik was close by at just the right time, and looped back to ensure Peter also got safely passed this threatening patch. It was rather amazing, and very comforting, that our safety driver had been right there on hand at the one spot needed in the ride so far. I think I reached the Wimpy first, then soon after Hendrik, and only minutes behind Peter. I immediately recognised our waitress from the 300km a month before – and she clearly recognised us. “Where have you been riding this time?” she quipped, and flashed the sort of smile at our response which is usually reserved for the clinically insane. It was a priceless moment – Hendrik clearly amused and delighted by our local minor celebrity status. Even with taking time to enjoy multiple coffees and toasted sandwiches we’d still managed to preserved the two hour buffer which had cushioned our passage all day. We resolved to take it slow and steady on this last 50km or so – no need to rush, we may as well pace out a nice even tempo and preserve tired legs and bodies. The route home was largely quiet, as we had found at the tail of the 300km ride. An occasional car, often travelling very fast, but generally not much in the way of traffic. One car pulled a very odd stunt in front of us somewhere past the grain silos – slamming it’s brakes on, swerving into the safety lane, and then angling the car’s nose slightly outward again. It was at one and the same time both odd, and highly worrying. I gave the car as wide a berth as I safely could as we rode past, but I half expected to be jumped, or have the car come out and nudge me off the bike. It didn’t happen, the car U turned once we had ridden by and sped back in the direction of Malmesbury. It was hard to figure out what the purpose of this manoeuvre was – but the worrying thought that they had been checking our bikes out occurred to both of us. Some way down the road we saw Hendrik and asked if he wouldn’t mind keeping an eye on us over the last few kilometres. We were almost home, but the remote chance that they had gone back to fetch some mates seemed a risk just not worth taking. They didn’t re-appear, or if they did Hendrik’s presence a discrete distance behind us was enough to put off anything they may have had in mind. At last, the N1 came into sight. We rushed down towards it, up the nasty little ramp over it, and within minutes were turning left into Vrede wines. Home. Our first PBP qualifier in the bag, and Peter’s longest ride to date. He’d prevailed through stomach upset, sleepiness, and almost total fatigue towards the end. As I shared a beer with Nico and Henri after the ride I commented on how impressively fast some of the guys times for the ride had been. Nico replied that in many ways he found Peter’s accomplishment somehow even greater – battling to overcome real adversities and finish a ride that would have broken the spirit of many riders. It was an amazing display of mental strength. And had brought about the first official nickname of our SR Series – The Zombie – awarded to Peter for returning from the dead on at least four occasions to complete the ride.